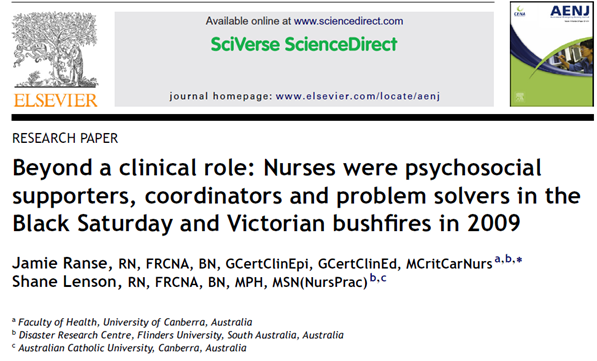 Aim: This research explores the roles of nurses that participated in the Black Saturday and Victorian bushfires in February 2009, including aspects that influence nurses’ roles, such as prior education, training and availability of resources. 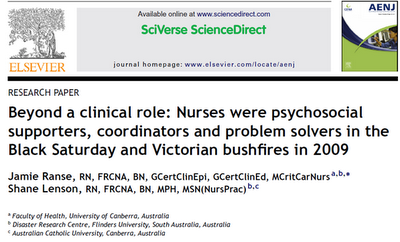 Background: It is acknowledged that nurses play an important role in disaster response and recovery. However, our understanding of nurses’ roles is superficial and commonly based on descriptions of events in which specifics relating to the nurses’ roles are embedded within other topics or issues. Similarly, aspects that support nurses in the disaster environment, including previous experience, education and the provision of resources, are not well understood. Method: Single, semi-structured telephone interviews were conducted with 11 volunteer nursing members of St John Ambulance Australia. These interviews were electronically recorded, transcribed verbatim and thematically analysed using a well-recognised human science approach. Findings: The thematic analysis identified two broad themes: being prepared and having an expansive role. Participants indicated that they were educationally prepared and had adequate clinical experience. They outlined that they took many resources with them; however, they were used very little, as their role consisted of minimal clinical care. Additionally, nurses performed roles including a psychosocial supporter, a coordinator of care and resources, and problem solvers. Conclusions: The nurses’ role in providing health care during and/or following a disaster is more than a clinical care role. This understanding should be applied to the development of education programs, competencies and policies, with a particular focus on contextualising the education to the realities of possible disastrous scenarios that incorporates elements of coordination, problem solving and psychosocial care within a national framework. Additionally, this awareness education should be used to inform nurses about the realities of working in disaster environments.